Initial Appearance in Criminal Actions - Renee E Mura S.C. I received a notice to appear at an Initial Appearance for the criminal case against me in Wisconsin. What should I expect? An “Initial Appearance” in a criminal action in the State of Wisconsin is true to its name – it is the first time you will appear before a court official in your criminal case. You are required to appear at the Initial Appearance in your criminal case. If you fail to appear, the Court may issue a warrant for your arrest. (2) a statement of probable cause, which is a sworn statement that must provide the Court with adequate factual information to find that the crimes were probably committed. 2. You will appear before a court official. (1) Any person who is arrested shall be taken within a reasonable time before a judge in the county in which the offense was alleged to have been committed. In Wisconsin, a court official, either a Commissioner or a Judge, will preside over your Initial Appearance. 3. The Court will ask you if you have an attorney. If you do not have an attorney, the Court will advise you of your right to an attorney. You have right to an attorney to represent you in your criminal action. The Court will advise you of your right to an attorney. If you retain an attorney prior to the Initial Appearance, your attorney will appear with you at the Initial Appearance and speak on your behalf. 4. The Court will state the criminal charges against you and the possible penalties you face if you are found guilty of the offenses. The criminal charges explained to you by the Court will reflect the charges specified in the Criminal Complaint. The Court must also advise you of the possible penalties you may face if you are found guilty of the crime as charged, such as the maximum fines and imprisonment time. If the charge is a felony, the Court must also inform you of the penalties associated with being found guilty of a felony. The possible penalties will also be specified in the Criminal Complaint. 5. The Court will review the Criminal Complaint to determine if it contains adequate factual information to find probable cause (i.e. to find that the crimes were probably committed based upon the facts provided). 6. The Court will address bail and impose bond conditions. “Bail” is the monetary condition of your release from custody. Bail exists to ensure that individuals facing criminal charges will appear in court for all future court hearings. If the Court imposes cash bail, you (or someone on your behalf) will be required to pay the amount of cash in full for you to be released from custody during the pendency of your criminal action. 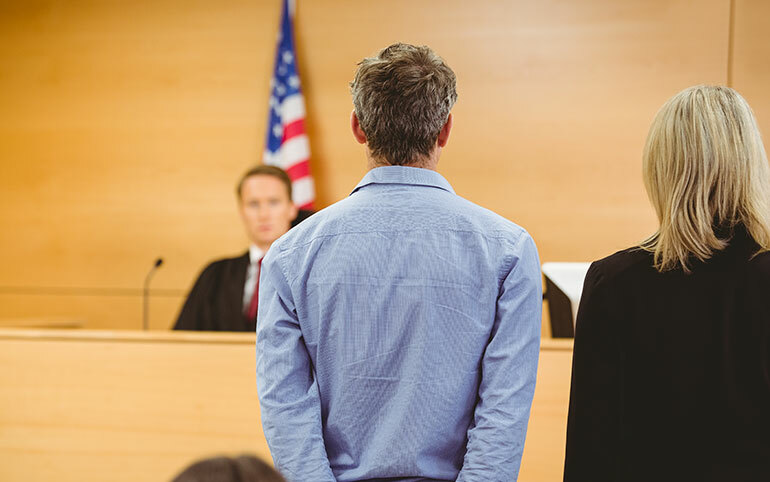 If the Court believes you will appear in court voluntarily for future court hearings, the Court may impose a signature bond instead of cash bail. If the Court orders a signature bond, there will still be a cash amount associated with the bond. You will only be required to sign the bond to be released from custody after your initial appearance. However, if you do not appear in Court or do not follow your bond conditions (explained below), bail may be revoked, and you will owe the cash amount associated with the bond. If you fail to comply with the bond conditions ordered by the Court, bail may be revoked. Revocation of bail may result in an order that you must pay additional amounts in cash bail to be released from custody, and/or an order for the forfeiture of the cash amount associated with your signature bond. 7. The Court will schedule the next hearing in your case.